Based on the classic short story by James Turber of an ordinary man who escapes his humdrum life by day-dreaming his own fantasy world, full of romance and adventure. Ben Stiller who also directs, stars as the eponymous Walter in this updated tale from the 1947 movie, setting the character within the real “Life” magazine, as it transitions from print to digital. Walter is a negative cutter, handling photos from freelance photojournalist’s providing glossy shots for the magazine. Walter edits, chooses the best and has over time built up a relationship with the magazine’s star correspondent “Sean O’Connell” (Sean Penn). Walter is the committed anonymous company man, doing a good job, not expecting much and whose only ambition is to keep doing what he loves, therefore a prime target to be dismissed as surplus to requirements. The magazine changes are led by the comically smarmy “Manager of Transitions” Ted Hendricks (Adam Scott) complete with an unsuitable beard. This gives plenty of opportunity for comment on the current corporate world of downsizing, restructures and “re-alignments” unfortunately many of these are missed and are played for half laughs rather full comedy or drama. Meanwhile Walter nurses a crush on new employee “Cheryl” (Kristen Wiig) who is largely unaware of Walter’s existence let alone interest. An opening sequence at a train station sets the tone of the film. Walter daydreams and we get to see in real time, what he would really like to be doing, rather than the reality. After a while and in keeping with the movies tagline “Stop dreaming. Start living”, Walter who is tasked with recovering a vital negative, sets out on a voyage of discovery that tops even his wildest imagination. It is clear Stiller was able to secure a large budget and the money is on the screen in the form of exotic far flung locations, including Iceland and British Columbia. The story starts well, as mentioned the opening dream is unexpected and very effective. After we meet Walter’s family, (Shirley MacLain and Kathryn Hahn) as mother and sister respectively, we get on the road where Stiller appears to lose the narrative structure and almost forgets to include a story. 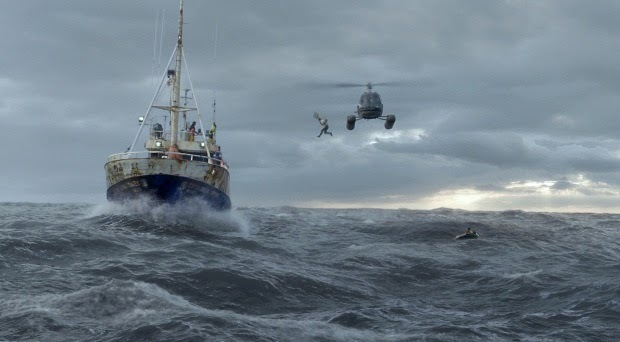 What fills the void are stunning locations and special effects, together with a very amusing and impressive combination involving a helicopter pilot, a boot of beer and a trawler on the high sea. Not to be outdone, another beautifully filmed skateboard sequence acts as a prelude to the another Iceland iconic event. Stiller the actor plays the role straight without his usual irony, although is somewhat colourless in the main role. Wiig, does not get as much to do as she should but provides a very believable object of unrequited love whilst channelling her “Friends” era Jennifer Aniston look and mannerisms. Penn almost cameos but manages to convey a hardbitten stereotypical photojournalist in just a few words and looks and a shout out to Walter’s long suffering cubicle buddy “Hernando” (Martinez), somebody you would want on your side. Scott overplays the transition manager role, which is a shame as the film could have had something interesting to say about painful transitions but this is not that film. Which begs the overall question, what the film is really about? This is a very ambitious movie and it is good to see risks being taken, Stiller makes interesting use of titling within the film and the soundtrack, Bowie’s “Space Oddity” making the usual positive impact. However the “Benjamin Button” sequence could have been left on the cutting room floor, trimming the running time. Arguably the film latterly becomes an expensive “Red Bull” style reel, which is no bad thing but dispatches with any attempt at a coherent story. Whether this matters is up to the audience to decide, although Box Office returns whilst reasonable, suggest Walter may not go daydreaming again any time soon. An bold attempt which ultimately falls short bearing in mind the source material but is certainly not without merits.